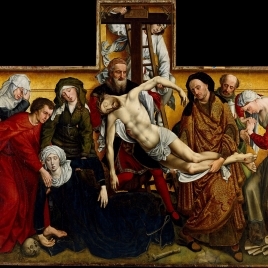 The Descent from the Cross was painted for the Chapel of Our Lady Outside the Walls at Leuven, which was founded in the fourteenth century by the Great Crossbowmen`s Guild, sold in 1798 and demolished soon afterwards. The two small crossbows that hang from the tracery in the corners of the panel indicate that it was commissioned by that guild. The earliest datable copy, the Edelheere Triptych of 1443 (Leuven, Saint Peter`s Church), shows that the Descent was completed before that date. Acquired from the Chapel by Mary of Hungary (1505-1558), it was displayed in 1549 in the chapel of her castle at Binche. Mary`s nephew Philip II of Spain placed it before 1564 in the chapel of his palace at El Pardo outside Madrid. Taken to the Escorial in 1566, it remained there until 1939, when it was transferred to the Prado. The shape of the Descent is that commonly used in Brabant for the centrepieces of large winged altarpieces. The projection at the top could have had its own small wings, while the rest could have been protected by rectangular shutters, possibly without imagery. Philip II commissioned new wing panels in 1566, which were painted by Juan Fernández Navarrete, El Mudo (1526-1579). The original wing-panels and El Mudo`s have been lost without trace. Cleaned in 1992-93, the painting is exceptionally well preserved. The figures are slightly less than life-size. Still wearing the Crown of Thorns, Christ has a beautiful though not an athletic body; there are no injuries from his Flagellation. Anatomical accuracy is sometimes sacrificed in order to make elegant shapes. Unusually, Christ is not bearded. His heavy stubble must have grown during his torments. His right eye is slightly open to reveal a tiny area of white from a rolled back eyeball. The wound in his side exudes blood that is clotting and separating into the blood and water of John 19:34. The loincloth is so transparent that blood flowing under it is easily visible. The blood, however, does not stain the loincloth, which is one of the Virgin`s veils. Christ`s body is being lowered from the Cross by three men. The old man is probably Nicodemus, a Pharisee and a ruler of the Jews (John 3:1-21; 7:50). The youth, apparently a servant, holds two viciously long and bloodstained nails removed from Christ`s hands; he has managed not to get bloodstains onto his white scarf, his white hose or his pale blue damask robe. The figure wearing cloth of gold is probably Joseph of Arimathea, the rich man who obtained Christ`s body and laid it in his own new tomb (Matthew 27:57-60). He looks very like the Portrait of a Stout Man (Madrid, Museo Thyssen-Bornemisza, inv. 74). On the extreme right, the woman wringing her hands is the Magdalen. Behind Joseph, the bearded man in green is probably another servant. The pot that he holds may be the emblem of the Magdalen and may contain some of the ointment of spikenard, very costly, with which she anointed the feet of Jesus (John 12:3). On the left, the Virgin has fainted and is falling in a pose that echoes that of Christ`s dead body. Suffering with Christ, she is undergoing her Compassio. Her eyes are half-open but her eyeballs have rolled back. Tears stream down her face and one is about to drop from her chin. She is sustained by Saint John the Evangelist, assisted by a woman in green, who is probably Mary Salome, the Virgin`s half-sister and John`s mother. The woman behind her may be Mary Cleophas, the Virgin`s other half-sister. The space within the gilded box is completely at variance with the space occupied by the figures. At the top, the Cross is immediately behind the tracery; but, lower down, there is room in front of the Cross for Nicodemus, Christ and the Virgin. Aware that the spatial incongruities could not be made too obvious, Rogier has concealed the principal junctions. He has enormously lengthened the Virgin`s left leg, so that her left foot and mantle hide the base of the Cross and one upright of the ladder. The pose of the man in green is contorted so that his right foot and the furred hem of his robe partially conceal the other upright of the ladder. Though the subterfuges are not immediately obvious, the false perspectives engender feelings of unease. The viewer cannot fail to be disturbed by them. Christ`s head is on a horizontal axis, which seems unnatural, and his nose is twisted out of perspective to make a more assertive horizontal. 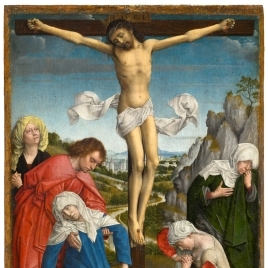 Since the whole picture is strongly lit from the right, Rogier can illumine Christ`s face from below so that the parts normally in shadow are brightly illuminated. The unexpected stubble makes a different contribution to the shocks engendered by the image. The thorns embedded in his flesh and ear are painful; but the expressive use of pattern, light and irrationality greatly enhances the horror. Only the Magdalen makes a violent gesture, repeated to some degree in the shape of the fluttering cloth attached to the young man on the ladder. He, the man in green and Nicodemus are the only protagonists who are not weeping. The first two are the least involved of all the bystanders but their facial expressions indicate that they are deeply moved. Rogier has not tried to differentiate reactions dramatically by contrasting gestures or facial expressions. The immense power of the painting lies less in attempts to understand and individualise the emotional reactions of the protagonists than in indirect, even subliminal, attacks on the feelings and thoughts of the viewer. Rogier probably began by making a detailed study to be approved by his patrons. Using rather large brushes and a paint rich in medium, he then copied his study freehand, and this copy constitutes the bold underdrawing that is revealed in infrared reflectograms. When he painted, he did not always follow his underdrawing: the heads of Mary Salome, Joseph of Arimathea and the bearded man in green are underdrawn higher; several of the hands and feet, the rungs of the ladder and many areas of drapery have been altered. Rogier`s changes of mind are always of interest, while the underdrawing itself, rapidly and boldly executed, reveals a spontaneous creativity that may surprise many observers. The sureness and speed of his technique and the confidence of his brushwork are best admired through microscopes or in vastly enlarged detail photographs (Campbell, L.: Rogier van der Weyden, Museo Nacional del Prado, 2015, pp. 74-81). Height: 204.5 cm. ; Width: 261.5 cm. Madrazo, Pedro de1816-1898, Viaje artístico de tres siglos por las colecciones de cuadro, Daniel Cortezo y Cª, Barcelona, 1884, pp. 61. Sigüenza, José de, Historia de la Orden de San Jerónimo, II, Madrid, 1909, pp. 547,635. Laford, Paul, Roger Van Der Weyden, G.Van Oest & Cie, Bruselas - Paris, 1912, pp. 40. Kaemmerer, Ludwig, Memling, Delhagen and Klafing, Estrasburgo, 1913, pp. lám.17. Burger, Willy, Roger van der Weyden., Karl W.Hiersemann, Leipzig, 1923, pp. lám.1. Friedländer, Max J., Die altniederlandische malerei, Paul Cassirer, Berlín, 1924, pp. 50 láms.6,7. Verlant, Ernest, La peinture ancienne a l'exposition de l'art belge a Paris en 1923, G. van Oest & Cie., Bruselas - París, 1924, pp. 47-50. Alvarez Cabanas, A., Roger Van Der Weyden en el Museo del Prado, Imp.Helenica, Madrid, 1927, pp. 61. Fierens-Gevaert, Hippolyte, Histoire de la Peinture Flamande des Origines a la Fin du XV, G.Van Oest, Paris Bruselas, 1928, pp. 30. Alvarez Cabanas, A., El Descendimiento. Tabla de Roger van der Weyden, Real Monasterio, Escorial, 1930. Zarco Cuevas, Julián, Inventario de las alhajas, pinturas y objetos de valor y curiosidad donados por Felipe II al Monasterio de El Escorial (1571-1598), Tipografía de Archivos, Madrid, 1930, pp. 142. Carpenter, William Hookham, Mémoires et documents inédits sur Antoine Van Dyck, P. P. Ru, I, imprimerie de J.-E. Buschmann, éditeurchez K. Fuhr, Paris Bruselas, 1930, pp. láms.55-59. Renders, Emile, La solution du problème: Van Der Weyden, Flémalle, Campin, I, Firme Charles Beyaert, Brujas, 1931, pp. 63,70/ lám.34,141. Noul, M., Sotomayor, F., Muguruza, P., Les chefs-d'oeuvre du Musée du Prado, Musée d'Art et d'Histoire, Ginebra, 1939, pp. 29. Gheon, Henri, Marie, Mere de Dieu, Pierre Tisne, 1939, 1939, pp. lám.88. Michel, Edouard, Roger van der Weyden, Plon, Paris, 1945, pp. 9. Von Simson, Otto, Compassio and Co-Redemptio in Roger van der Weyden's descent from the Cross, The Art bulletin, 35, I, 1953, pp. 9-16. Lassaigne, Jacques, La Peinture Flamande. Le Siecle de Van Eyck, Albert Skira, Genova, 1957, pp. 79. Tüngel, Richard, 400 Jahre Kunst, Kultur, und Geschichte im Prado, Schweizer Verlagshaus, Zurich, 1964, pp. 32/ lám.10-11. Dohmann, Albrecht, Die Altniederlandische Malerei des Funfzehnten Jahrhunderts, E.A.Seemann BuchUnd Kunstverlag, Leipzig, 1964, pp. lám.85. Frinta, Mojmirs, The Genius of Robert Campin, Mouton & Co, La Haya - Paris, 1966, pp. 82 lám.40-44. Huysmans, J.K., Trois primitifs: les Grünewald du Musée de Colmar Le Maître, Flammarion, Paris, 1967, pp. 150. Schiller, Gertrud, Ikonographie Der Christlichen Kunst. Inkarnation. Kindheitau, Gerd Mohn, Gutersloh, 1968, pp. lám.563. Cuttler, Charles D, Northern Painting. From Pucelle To Bruegel. Fourteenth, Fift, HoltRinehart and WinstonInc, Nueva York, 1968, pp. 112. Blum, S. Neilsen, Early Netherlandisch triptychs. A study in patronage, University of California press, Berkeley Los Angeles, 1969, pp. 46. Panofsky, Erwin1892-1968, Early netherlandish painting: its origins and character, Icon Editions, Nueva York, 1971, pp. 168-256 L.176. Davies, Martin, Rogier Van Der Weyden: an essay, with critical catalogue of paintings assigned to him and to Robert Campin, Phaidon, Londres, 1972, pp. 223-226. Peppin, Anthea Vauhan, William, Flemish painting, Phaidon, Oxford, 1977, pp. lám.7. Arte Veneta., Arte Veneta, 32, 1978, pp. 169-173. Hollanders-Favart,D. Van Schoute,R. Didier,R. et al., Le dessin sous-jacent dans la peinture. Colloque III.Le problème Maître de Flémalle-Van der Weyden, Université Catholique de Louvain, Louvain-La-Neuve, 1979, pp. 6-8. Puyvelde, Leo van, Les Primitifs Flamands, Les ateliers d'art graphiques Medde, Bruselas, 1979, pp. lám.34. Smolar-Meynart, A. Eeckhout, P. Deknop, A., Rogier van der Weyden. Rogier de le Pasture. Peintre officiel de la Ville de Bruxelles, Crécit Communal de Belgique, Bruselas, 1979. Vaizey, Marina, The St.Michael guide to famous paintings, Artus, Londres, 1979, pp. 18. Gombrich, E.H.1909-2001, The Story of Art, Phaidon, Oxford, 1979, pp. 209 lám.181. Bermejo, Elisa, La pintura de los primitivos flamencos en España, I, C.S.I.C., Instituto Diego Velázquez, Madrid, 1980, pp. 103-108. Musper, H.T., Netherlandish Painting From Van Eyck To Bosch, Harry N.Abrhams Inc., Nueva York, 1981, pp. 25 lám.23. 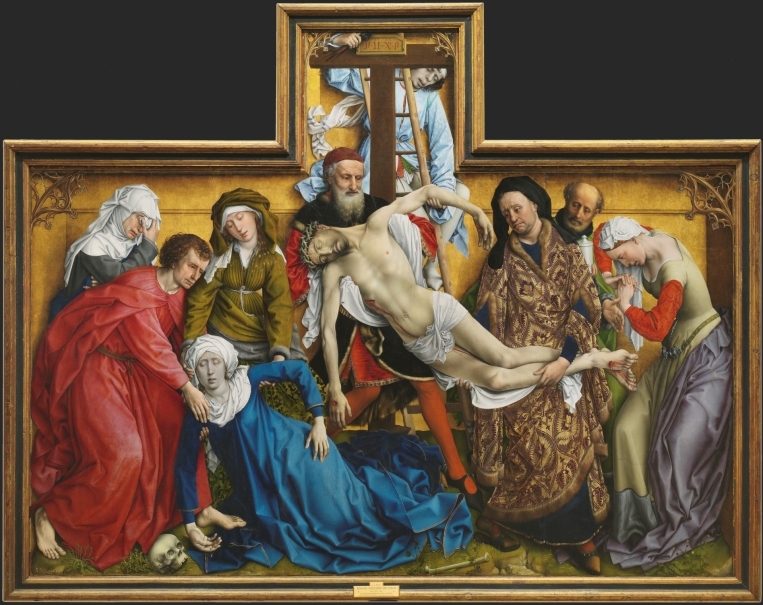 Van Asperen de Boer, J.; Van Schoute, R; Garrido, M.C; Cabrera,J., Algunas cuestiones técnicas del Descendimientos de la Cruz de Roger van der Weyden, Boletín del Museo del Prado, 4, 1983, pp. 39-49. Courthion, Pierre, La Peinture Hollandaise et Flamande, Fernand Nathan, 1983, pp. 26. Prevenir, Walter, Les Pays-Bas Bourguignons, AlbinMichel, Paris, 1983, pp. 285. Lane, Barbara G., The altar and the altarpiece. sacramental themes in early ne, Harper & Row, Nueva York - Londres, 1984, pp. 88 lám.56. Silver, Larry, The Paintings of Quinten Massys: with catalogue raisonné, Phaidon, Oxford, 1984, pp. 48 lám.49. Perier-D'Ieteren, C., Colyn de Coter et la technique picturale des peintres flamands du XV siècle, Lefevre et Gillet, Bruselas, 1985, pp. lám.30a, 30b. Morán Turina, José Miguel, El coleccionismo en España: de la cámara de maravillas a la, Cátedra, Madrid, 1985, pp. 116. Liebaers, H., L'Art Flamand des Origenes a Nos Jours, Albin Michel, Paris, 1985, pp. 110. Splendeurs d'Espagne et les villes belges: 1500-1700, Europalia 85 España, Europalia 85 EspañaCrédit Communal, Bruselas, 1985, pp. 250-251. Germanischen National Museum Nurnberg, Veit stok. Die vortrage des Nurnberger symposions, Deutscher kunstverlag, Munich, 1985, pp. 94/ lám.46. Ciudades del siglo de Oro: las vistas españolas de Anton Van, Ediciones El Viso, Madrid, 1986, pp. 27/ lám.9. Ruiz Alcón, M.T. Díaz Gallegos, C. Herrero, C., Colecciones Reales del Patrimonio Nacional, Patrimonio Nacional, Madrid, 1986, pp. láms.11-13. Brown, Jonathan1939-, Las Colecciones del Rey. Pintura y Escultura, Patrimonio Nacional, Madrid, 1986, pp. 147. Lecat, Jean-Philippe, Le Siècle de la Toison d'Or, Flammarion, Paris, 1986, pp. 56. Mander, Karel Van, Hirneves Nemetalfodi Es Nemet Festok Elete, Helikon Kiado, Budapest, 1987, pp. lám.16. Delenda, Odile, Rogier van der Weyden. Roger de la Pasture, Éitions du cerf tricorne, Paris, 1987, pp. 41 lám.12. Verougstraete-Marcq, Hélène van Schoute, Roger, Cadres et supports dans la peinture flamande aux 15e et 16e siècles, H.Verougstraete-Marcq et R.van Schoute, Heure-Le-Romain, 1989, pp. 79. Bialostocki, Jan, Il Quattrocento Nell'Europa Settentrionale, Utet, Turin, 1989, pp. 83. Museo Nacional del Prado, La pintura flamenca en el Prado, IbercajaFonds Mercator, Amberes, 1989, pp. 31. Doce artistas de vanguardia en el Museo del Prado:Saura, Bar, Mondadori, Madrid, 1990, pp. 216. Verougstraete-Marcq,H. Van Schoute, R. Faries,M. et al., Le dessin sous-jacent dans la peinture. Colloque VIII. Dessin sous-jacent et copies, Univerité Catholique de Louvain, Louvain-La-Neuve, 1991, pp. 109-121. Checa Cremades, Fernando, Felipe II: mecenas de las artes, Nerea, Madrid, 1992, pp. 436. Panofsky, Erwin1892-1968, Les Primitifs Flamands, Hazan, Paris, 1992, pp. 453 láms.323,324. Klein, Dan, The History of Glass, Orbis, Zwolle, 1992, pp. 137-143. Thürlemann, Felix, Die Madrider Kreuzabnahme und die Pariser Grabtragung: das malerische und das zeichnerische Hauptwen Robert Campins, Bruckmanns Pantheon, 51, 1993, pp. 19-44. 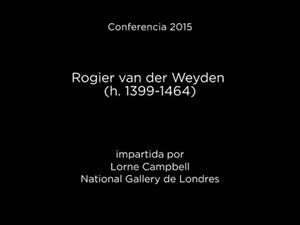 Campbell, Lorne, Rogier van der Weyden and his Workshop, Proceedings of the British Academy, 1993, pp. 1-24. Dávila, Mª Teresa; Garrido, Mª del Carmen, Informe técnico y proceso de restauración del Descendimiento de la Cruz de Roger Van der Weyden., X Congreso de Conservacion y Restauracion de Bienes Culturales, Cuenca, 1994. Les primitifs flamands et leur temps, La Renaissance du Livre, Belgique, 1994, pp. 134,267. Sander, Jochen, Die entdeckung der kunst. Niederlandische kunst des 15 und 16 jahrhunderts in Frankfurt, Verlag Philipp von Zabern, Mainz, 1995, pp. 120. Simon, Achim, Ein 'Kalvarienberg' in Christlichen Museum von esztergon zur Weyden reception in Süddeutschland, Annales de la Societé Royale d'Archéologie de Bruxelles, 61, 1996, pp. 79-90 [81 f.2]. Châtelet, Albert, Robert Campin. Le Maitre de Flemalle. La Fascination du Quot, Fonds Mercator, Anvers, 1996, pp. 273. Alvarez Cabanas, A., Roger Van Der Weyden en el Museo del Prado, Imp.Helenica, Madrid, 1996, pp. 73. 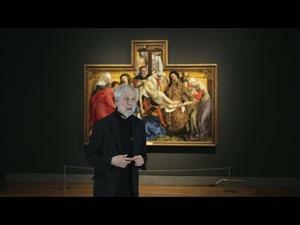 Garrido, Carmen, 'The Campin group paintings in the Prado' en Robert Campin. New directions in scholarship, Brepols, Bruxelles, 1996, pp. 55. Stroo, C. Syfer-D'Olne,P. Dubois, A., The Flemish primitives. I The Dirk Bouts, Petrus Christus, Hans Memling and Hugo van der Goes, Brepols, Brussels, 1996, pp. 150,217,223 / lám. 75. Pächt, Otto, Early Netherlandish Painting From Rogier Van Der Weyden To G, Harvey Miller Publishers, Londres, 1997, pp. 23. Panofsky, Erwin1892-1968, Los primitivos flamencos, Ediciones Catedra, Madrid, 1998, pp. 254 lám.67. Un príncipe del renacimiento: Felipe II, un monarca y su época, Sociedad Estatal para la Conmemoración de los centenarios de Felipe II y Carlos V, Madrid, 1998, pp. 350. Castillo-Ojugas, Antonio, Una visita médica al Museo del Prado, You & Us, Madrid, 1998, pp. 119. Coignard, Jerome, Les larmes de Maître Rogier, Connaissance des arts, 1999, pp. 60-64. Nicolaissen, Jan, Martin Schongauer ein mitarbeiter dez werkstatt Hans Memling?, Bruckmanns Pantheon, 57, 1999, pp. 39/ lám.24. Dhanes, E. Dijkstra, J, Rogier de Le Pasture Van der Weyden. Introduction a l'Oeuvre. Relecture des sources, La Renaissance du livre, Tournai, 1999, pp. 19/ lám.1. Vos, Dirk de, Rogier Van Der Weyden: The complete works, Harry N. Abrams, New York, 1999, pp. 10,185. Yarza Luaces, Joaquín, Roger van der Weyden, Descubrir el arte, 2000, pp. 64-73. Mateo, Isabel, ''La pintura flamenca en El Escorial...''. En: El Monasterio del Escorial y la pintura., Actas del Simposium :1/5-IX-2001 Instituto Escurialense de investigaciones hisstóricas, San Lorenzo De El Escorial, 2001, pp. 11. Museo Nacional del Prado, Pintura flamenca de los siglos XV y XVI: guía, Museo del Prado, Aldeasa, Madrid, 2001, pp. 44. Thürleman, Felix, Robert Campin : a monographic study with critical catalogue, Prestel, Munich, 2001, pp. 111. Nieto Alcalde, Victor, El Descendimiento de Van Der Weyden, Tf, Madrid, 2003. González Mozo, Ana; Garrido, Carmen, Nouvelles recherches de systèmes digitaux pour l'etude technologique de la peinture' en Le Dessin Sous-Jacent et la Technologie dans la Penture., Uitgeverij Peeters, Lovaina, 2003, pp. 215. Gómez Pin, V., Qué cabe ver. En Historias inmortales, Barcelona, 2003, pp. 55-70. Nutall, Paula, From Flanders to Florence. The impact of Netherlandish painting, 1400-1500, Yale University press, New Haven, 2004, pp. 14. Campbell, Lorne, Van der Weyden, Londres, 2004, pp. 10,32. Heck, Christian, Collections du Nord-Pas-De Calais : la Peinture de Flandre e, I-II, Bij Peeters, Bruselas, 2005, pp. 220, 290. Domínguez, Ana. Treviñano, Pilar, Tradición del texto y tradición de la imagen en las Cantigas de Santa María, Reales Sitios, 42, 2005, pp. 15. Isabel la Católica y el arte, Real Academia de la Historia, Madrid, 2006, pp. 13-72. Harbison, Craig, El espejo del artista. El arte del Renacimiento septentrional, Akal, Madrid, 2007, pp. 44. Michiels, Alfred, Hans Memling, Parkstone Press International, Nueva York, 2007, pp. 160. Finaldi,G. Gómez Nebreda,M.L, Itinerarios de fe en el Museo del Prado, Mision Joven, Madrid, 2007, pp. 24. Howell Joly, P, Roger van der Weyden´s 'Pregnant Magdalene on the rethoric of dress in the Descent from the Cross', Studies in iconography, 28, 2007, pp. 209. Kemperdick Stephan, ''The Flémalle-Campin.Van der Weyden problem: still exixting''. En: Campin in context : peinture et société dans la vallée de l’Escaut et le Nord de la France à l’époque de Robert Campin 1380-1450, Koninklijk Instituut voor het 2007, Brussel, 2007, pp. 2-141/lám. 1. Dombrowski, D, Botticellis beweinung Christi in der Alten Pinakothek, Wallraf-Richartz-Jahrbuch, LXIX, 2008, pp. 169-210. Der Meister von Flémalle und Rogier van der Weyden : eine au..., Städel Museum . Gemäldegalerie de, 2008, pp. 76. Van Schoute,R, Dessin sous-jacent et dessin indépendant chez les Primitifs flamands. Quelques réflexions en vue de l´établissement d´un état de la question, Culture figurative e confronto tra Fiandre e Italia dal XV al XVII secolo, 2008, pp. 12-17. Borchert, T.H, Hans Memling and Rogier van der Weyden, Invention: northern renaissance studies in honor of Molly Faries, 2008, pp. 86-93. Invention: northern renaissance studies in honor of Molly Faries, Brepols, 2008, pp. 3-19. Acres, A., Posing intentions in Renaissance painting, Invention: northern renaissance studies in honor of Molly Faries, 2008, pp. 2-19. El esplendor del Renacimiento en Aragón, Gobierno de Aragón, 2009, pp. 277-278. Martens, Didier, Modèles et traduction (s) autour de deux primitifs Brabançons du Museo de Zaragoza, Annales de la Societé Royale d'Archéologie de Bruxelles, 70, 2009-2011, pp. 9-53 [13-14 f.5]. Campbell, Lorne, Rogier van der Weyden 1400-1464 : master of passions, Waanders Uitgeverij: Davidsfonds, 2009, pp. 32,18,34-46,134,152. El nacimiento de una pintura: de lo visile a lo invisible, Consorci de Museus de la Comunita, 2010, pp. 14-29, 84-91. 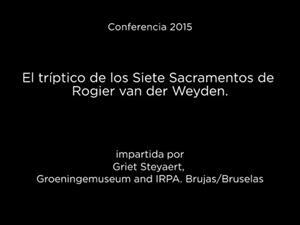 Diéguez Rodríguez, Ana, Precisiones a la historia documental de las copias de Michiel de Coxcie del Descendimiento de Roger van der Weyden en las Colecciones Reales, Quintana. Revista del Departamento de Historia da Arte, 9, 2010, pp. 105-117. Borchert, Till-Holger, Van Eyck to Durer: early netherlandish painting and Central Europe, 1430-1530, Lannoo, 2010, pp. 208-9, 212. Díez-Ordás Berciano, Mª Belén, Análisis de la Instrucción de 1566 dictada por Felipe II para la conservación y restauración de las obras depositadas en el Monasterio ''de Prestado'' de El Escorial, De Arte, nº10, 2011, pp. 83-104. Alberti, Francesca, La Descente de Croix de Daniele da Volterra: iconographie, fonction et contexte, Artibus et historiae, 33, 2012, pp. 189-237 . Weigert, Laura, Performance, Studies in iconography, 33, 2012, pp. 61-72 [65-69 fg.1]. 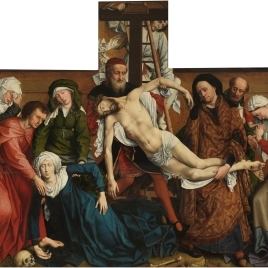 González Mozo, Ana, The new IRRS of The 'Descent from the Cross in the Prado' En:, Rogier van der Weyden in context. Seventeenth Symposium for the study of underdrawing and technology in painting. Leuven 22-24 Oct. 2009, Paris-Leuven-Walpole,Ma, 2012, pp. 228-235. Suykerbuyk, Ruben, Coxcie's copies of old masters: and addition and an analysis, Simiolus, 37, 2013-2014, pp. 5-24 [10-14 fig.17]. García-Frías Checa, Carmen, 'De la grandeza y variedad de la pintura que hay en esta casa' La colección pictórica de Felipe II en El Monasterio de El Escorialo, De El Bosco a Tiziano: arte y maravilla en El Escorial, Patrimonio Nacional, Madrid, 2013, pp. 35-51 [39,40 f.14]. Greub-Fracz, Krystyna., Die Grisaillen des Genter Altars. Altniederländische Skulpt..., Michael Imhof Verlag, 2014, pp. 142-143 L.58. 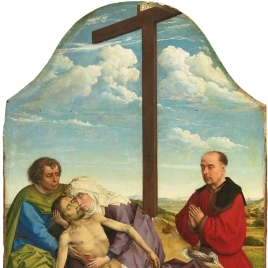 Kemperdick, Stephan., Ein Kreuzigungstriptychon von Rogier van der Weyden, Abegg-Stiftung, 2014, pp. 35-36, 40 L.16. Alba, L. García-Máiquez, J. Gayo, M. D. Jover, M. Silva, P., Las prácticas artísticas de los pintores ''hispanoflamencos'' en la Corona de Castilla en el siglo XV, Boletín del Museo del Prado, XXXII, 2014, pp. 122-147 . Pérez Preciado, José Juan, ''Restituir la paternidad de algunas tablas muy bellas''. Sobre las atribuciones históricas de la pintura neerlandesa antigua en el Museo del Prado (1819-1912)., Boletín del Museo del Prado, XXXII, 2014, pp. 12, 17, 22. Santos Bueso, Enrique, Oftalmología en el Museo del Prado, Gertograf, 2015, pp. 66. 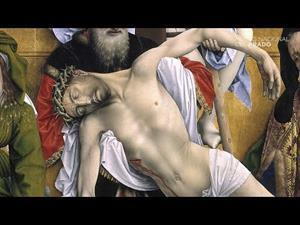 Campbell, Lorne, 'Rogier van der Weyden El Descendimiento' En:, Rogier van der Weyden y los reinos de la Península Ibérica, Museo Nacional del Prado, Madrid, 2015, pp. 74-81 n.1..
Miola, Robert S., 'Stabat Mater Dolorosa: Mary at the Foot of the Cross', The Sixteenth century journal, Fall XLVIII n.3, 2017, pp. 653-679 [671 f.4]. Ferrarino, Luigi, La Deposizione dalla Croce di Roger Van der Weyden, Studium, pp. 548-555.